These two beautiful Doggies were spotted on Catalina Island which is just offshore from LA in California. We had just completed a fun Family Photo Shoot and were taking in the scenery on the way back to our Hotel. 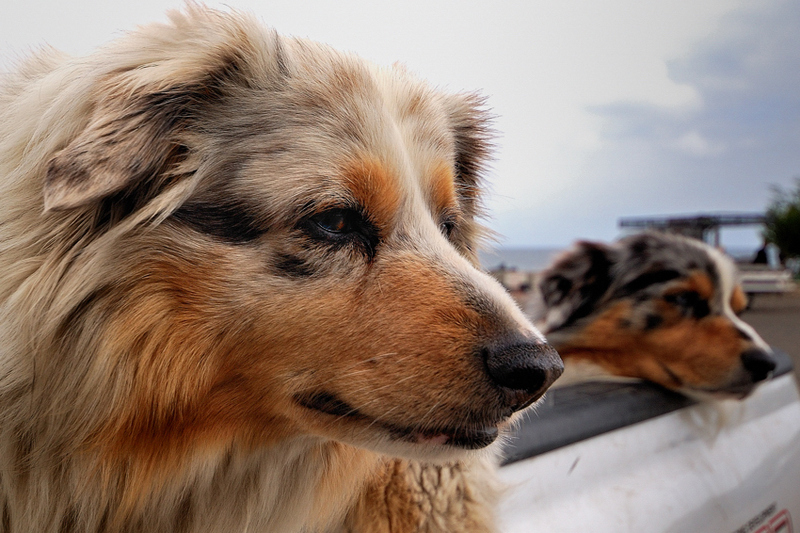 These two Cali-Dogs were so well-behaved that they just knew that Dad was going for a Dive and they could chill in the back of his truck – no leash, no barking, just waiting. There was a large group of Divers suiting up for some clear water exploration – Catalina offers some of the best diving in Southern California. Off shore, the island descends extremely and has an abundance of Kelp Forrest, Marine Life and clear water! We have sailed many times around this Island and marvelled at its raw natural beauty. If you ever go there, ask for a drink called Buffalo Milk. After the second, let the Bar Keep tell you the story behind the drink – it is charming to say the least! 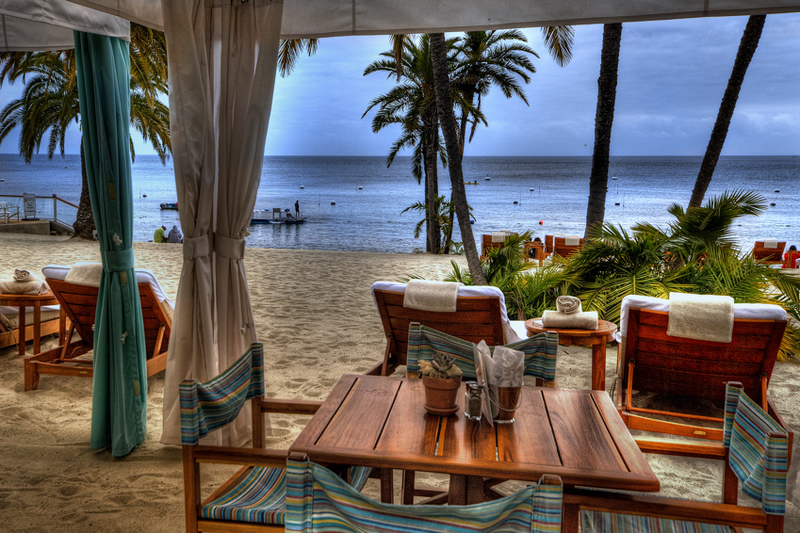 This was shot on the beautiful Island of Catalina, off the shores of Los Angeles. We had the privilege of being invited to a Family Photo Shoot and after scouting the Island for a location, we found this wonderful private beach. With Grand Parents, proud Mothers and Fathers and a restless children, what better place to have everyone relax as the intrepid Photographers choreographed the day! The results were stellar. During a trip to Catalina island, we were struck by the precision of the chimes that sounded every fifteen minutes and with beautiful and resonating sound. We found the tower after an ascent of around 500 meters. It was located close to what was once the home of Zane Grey, an American author best known for his popular adventure novels and stories that presented an idealized image of the O;d West. Riders of the Purple Sage (1912) was his bestselling book. In addition to the success of his printed works, they later had second lives and continuing influence when adapted as films and TV productions. This is an overview of Avalon Harbor – we were searching for the Chimes Tower and came across this stunning Vista. These moored vessels all pointing East seemed poised to race to Los Angeles, a short ~20 miles away with following seas. 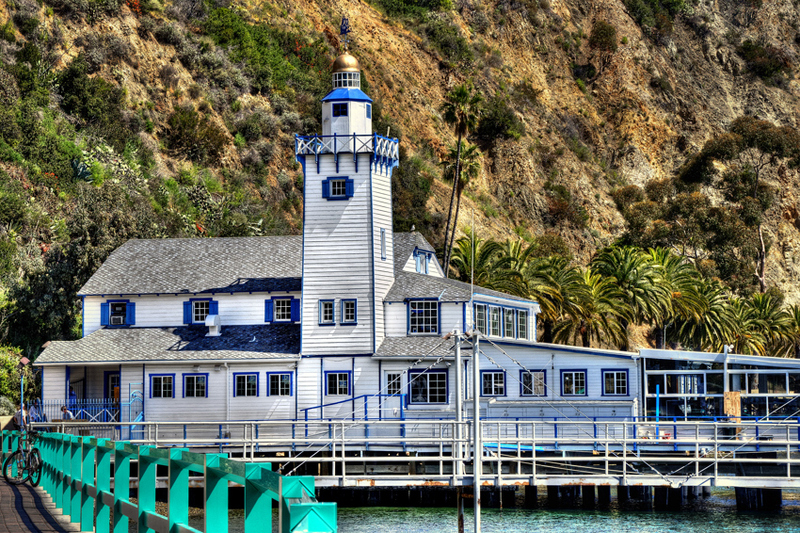 This is a view of the historic Catalina Yacht Club, located in Avalon Harbor, California. This is one of the oldest clubs on the west Coast, formed in 1893 by the Banning Brothers. 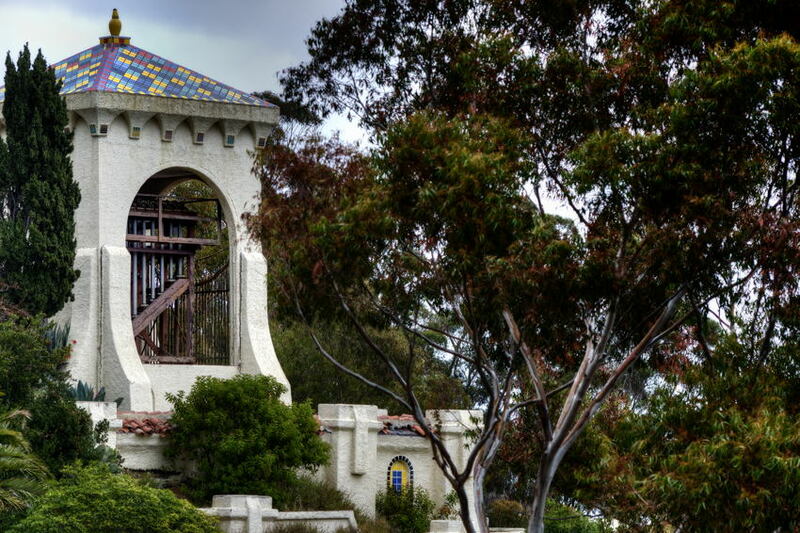 It has played host to such Hollywood personalities such as including Tom Mix, Jack Warner, Rudolph Valentino, King Vidor, James Cagney, Jascha Heifetz, and Darryl F. Zanuck. 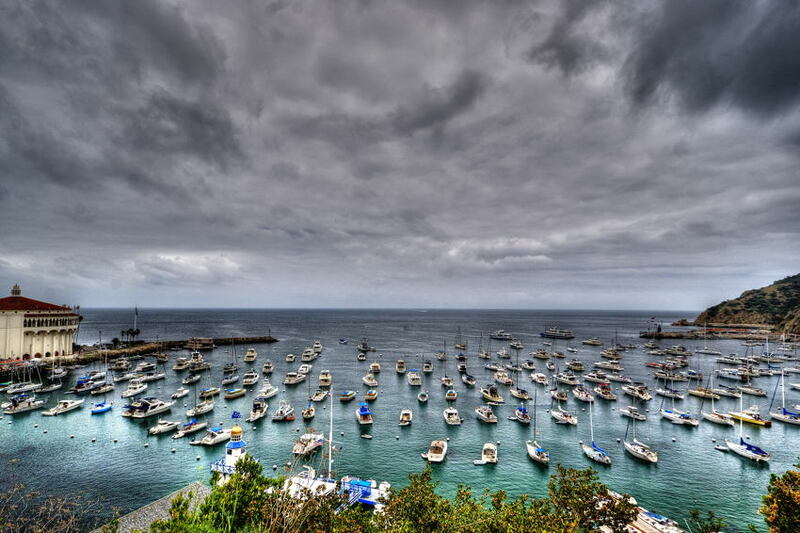 Catalina is home to two yacht clubs: Catalina Island Yacht Club is headquartered in Avalon Bay and Isthmus Yacht Club is headquartered in the 1864 Union Army Barracks at Two Harbors. Many mainland yacht clubs maintain Catalina stations. Moonstone is another private cove operated by the Newport Harbor Yacht Club of Newport Beach, California. 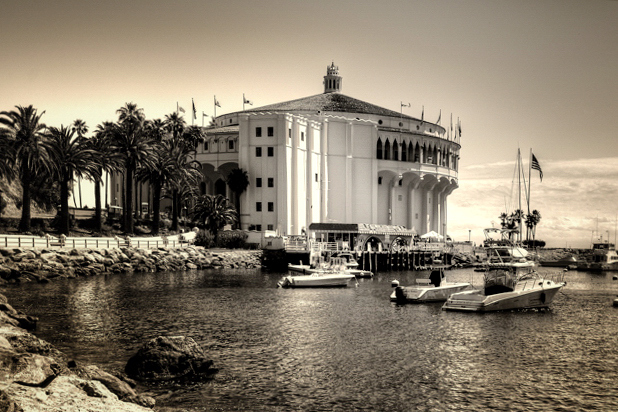 This is a shot of the Casino in Avalon Harbor on Catalina Island. The Casino is no longer in business, but is now a thriving Theatre and Museum. Many Hollywood luminaries used to frequent this Casino in older days as it was just a short ~20 miles from LA by boat. The Catalina Casino was built on the site formerly known as Sugarloaf Point. This site was cleared away to allow for the construction of the Hotel St. Catherine. However, this hotel was eventually built in Descanso Canyon instead. When chewing gum magnate William Wrigley, Jr bought the controlling stake in Catalina Island, he used this cleared spot to build the dance hall which he named Sugarloaf Casino. It served as a ballroom and Avalon’s first high-school. Its time as a casino was short, however, for it proved too small for Catalina’s growing population. In 1928, the Casino was razed to make room for a newer Casino. Sugarloaf Rock was blasted away to enhance the Casino’s ocean-view. 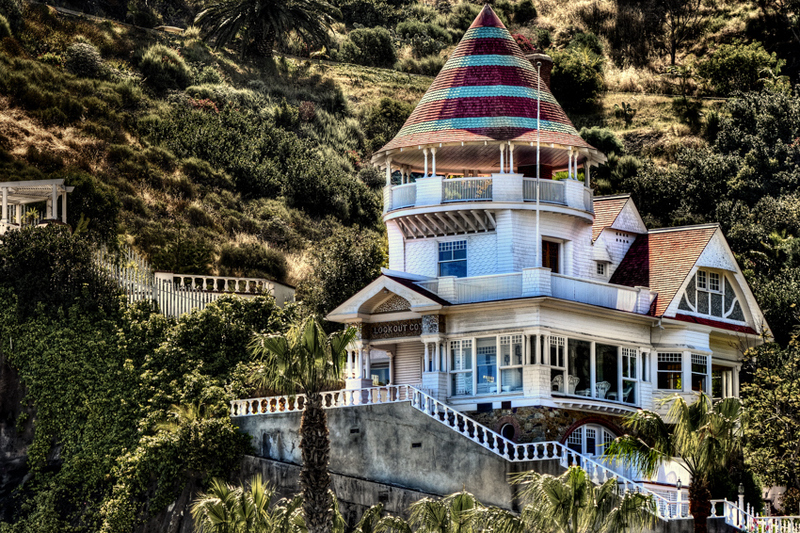 This is a shot of a classic “Cottage” overlooking the Harbor in Avalon on Catalina Island. It was recently put on the market and went quickly for a cool 6.5 million. By the end of the 19th century, the island was almost uninhabited except for a few cattle herders. At that time, its location just 20 miles (30 km) from Los Angeles—a city that had reached the population of 50,000 in 1890 and was undergoing a period of enormous growth—was a major factor that contributed to the development of the island into a vacation destination.